After a busy weekend with no time to do grocery shopping (or blog, for that matter! ), yesterday was all about easy meals with what was left in the fridge. 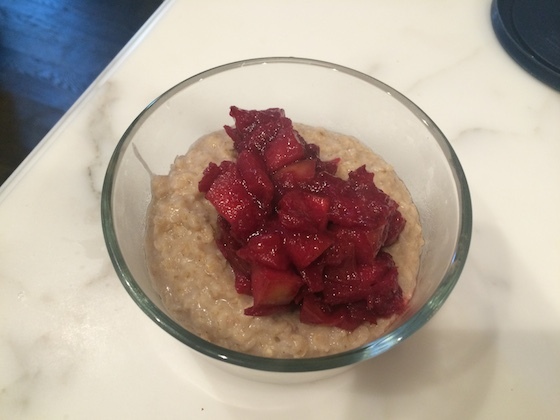 For breakfast, I whipped up some simple oatmeal and topped it with a serving of apple plum compote that I had stashed in the freezer. For lunch, I put together a salad with avocado, goat cheese, mixed greens, and dijon vinaigrette. This has been my favorite combination lately, and a great way to squeeze some veggies in midday! 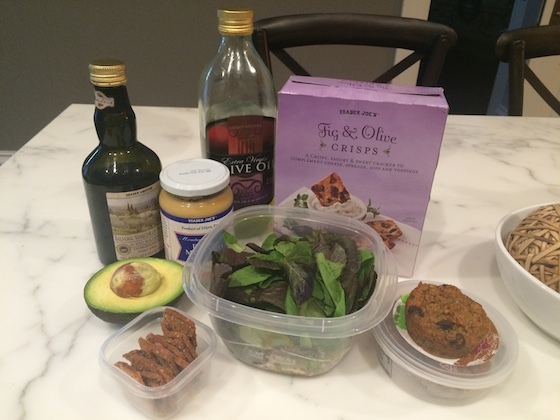 I paired the salad with some of these yummy fig and olive crackers from Trader Joe’s. I also brought a pumpkin muffin, which I enjoyed as a snack with a ripe pear. After work, I stopped at Trader Joe’s to pick up groceries for the week. 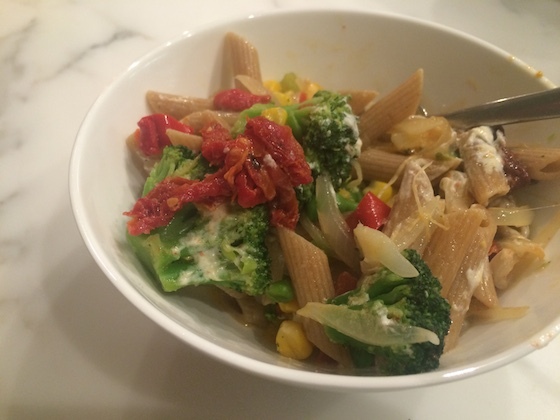 Then, I made this easy veggie pasta. In a large skillet, I sautéed an onion in olive oil. Then, I added minced garlic and a bunch of frozen veggies – broccoli, peppers, peas, and corn. Once everything was warmed through, I tossed it with cooked whole wheat penne, some sun dried tomatoes, fresh mozzarella, crumbled goat cheese, and a bit of olive oil. I’ve still got plenty of leftovers for later this week!